Wherever the oikos community goes, they bring the sun, even where it almost never shines: Lille. 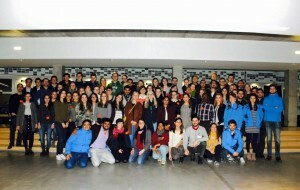 On Thursday March 17th, after an intense Presidents’ Meeting the previous day, oikos members from around the world were welcomed at the EDHEC Business School by the oikos Lille team. The Spring Meeting 2016 kicked off with a very important Legislative Meeting. We elected next Executive Board members, three more Full Chapters and the next oikos President: Levan Pangani. Once finished with the intense Legislative Meeting, members were taken on a small Lille tour and finished an unlimited “Tarte Flamande” meal at a typical restaurant in the city centre. On the second day and first official conference day, Ignace Schops and Francois Tasmowski came to visit by giving an interactive lecture on the entrepreneurial mindset both inside, and outside, corporate formats. As pioneers in the field they inspired members and followed intense discussions. The day then moved onto 4 workshops and 6 oikos Learning Circles, led by oikos members. Learning Circles on Finance, Economics, Entrepreneurship, Fashion, Management and Energy were executed where members had the opportunity to learn by doing and engage in true experiential learning with each other. The evening ended with delicious French “Gallettes” and “Crepes” as dinner. On the third day participants started the day with a challenge called “Hold Up”. With the mission of solving a challenge for an NGO working on fishery sustainability, participants went through an original methodology to come up with realistic and implementable solutions. The guest was impressed and happy with the results oikos members proposed. The day continued with the oikos Project Fair and the introduction of the call for applications for the First oikos Associate. The day ended with a Pitch Contest where small groups gave their best pitches for more sustainability in cities of their choice. The winning team came up with the “Good Jim” a gym that generates energy for multiple purposes whilst you work out. The final dinner was composed of another regional dish and beer elected as best in the world. See you at the FutureLab 2016! You may also read more on the oikos Vienna blog here.